The best compliment we receive is when people refer friends and family, and our referral program is our way of saying “thank you” to you, our favorite customer. Download and hand this referral card to your friend – they must have the card or provide this information when they purchase. Once they receive delivery, we will email or mail you your $50 gift certificate. There is no minimum purchase for your gift certificate so you can get a free accessory or apply it toward another purchase. There is no limit to the number of referral discounts you can receive ... so refer and receive today! or pick up more cards from any of our store locations. 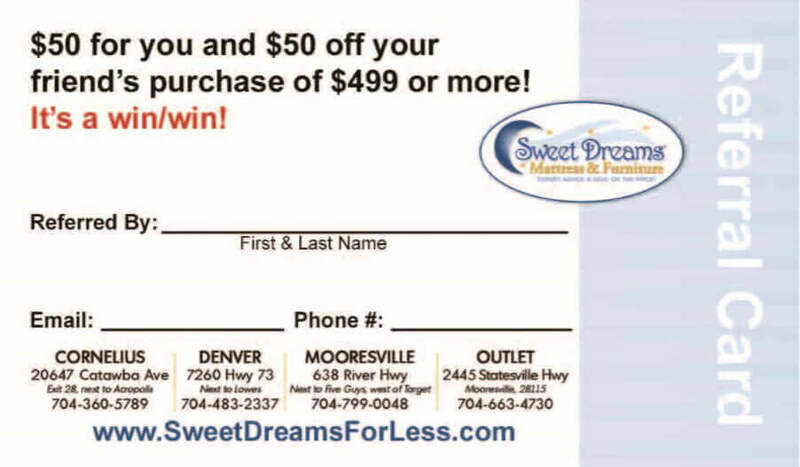 You get $50 Sweet Dreams gift certificate mailed to you if they buy $499 or more. *Please note: some restrictions may apply. The Referral Program applies for new customers only. Cannot be combined with other coupons. Store credit cannot be applied to previous purchases.